The main functions of the RSS will include such amenities as Restaurants, Shops, Health clinic, Bank/Bureau office, Car workshops: In roadside stations dedicated to cars, Trucks Cleaning repairs and inspection services, Fuelling Petrol station, Public information area/Administrative services, local community, markets for crafts& local produce, Service for trucks (repairs), Supermarkets, parking spaces providing secure parking yards for transit vehicles as well as rest facilities, restaurants, information centres, and outlets for amenities needed by truck crews, long distance passengers and, in some cases, the local communities. It is expected that RSSs that will accommodate trucks for long stops including overnight stays will attract more attention. However, the importance of short-stop RSSs also needs to be accorded due attention. Some leading transporters already require their drivers to stop for rest every two to three hours but this is hindered by lack of roadside facilities including parking space and security. 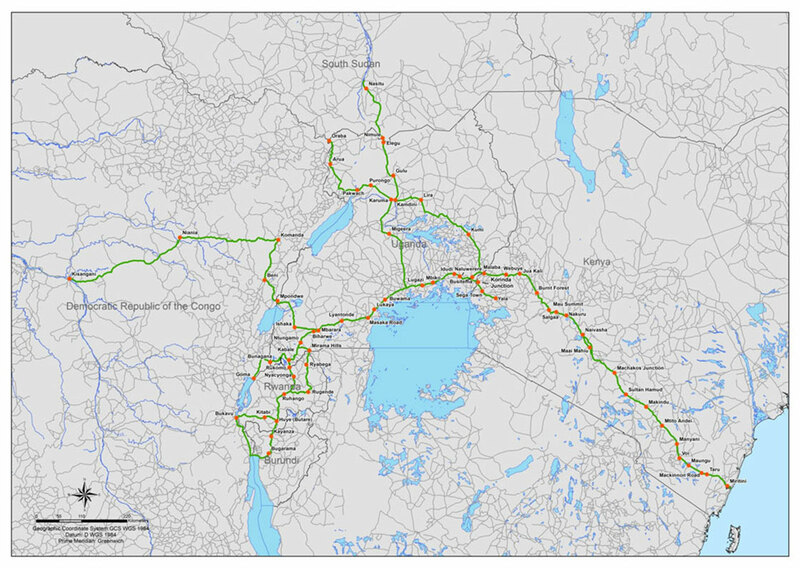 PHYSICAL LOCATION OF RSS: The map below show selected RSS locations along the Northern Corridor.